Lentils and Chickpeas: How Does Your Superfood Grow? Move over kale and quinoa, a new superfood is exploding on the market: pulses, as the dried seeds of leguminous plants are known. On grocery-store shelves in developed countries, a rapidly growing number of products, billing themselves as “natural” and “wholesome,” tout pulses such as lentils and chickpeas as an ingredient to lure health-conscious shoppers. Recent health studies have highlighted pulses for lowering the risk of diabetes and heart disease. The growing popularity of vegetarian and vegan diets in many countries has also given a boost to pulses, as more people rely on them as a source of plant-based protein. That has added to the allure of chickpeas, also known as garbanzo beans, which are already a consumer darling on the popularity of hummus snacks. Chickpeas are expected to continue their “meteoric climb,” the US Department of Agriculture predicted in a recent report. Unlike another so-called superfood, quinoa, whose limited growing areas caused shortages earlier this decade, worldwide production of pulses has gained ground in recent years. Lentils, believed to have originated in the Middle East, are now grown principally in Canada, for example. 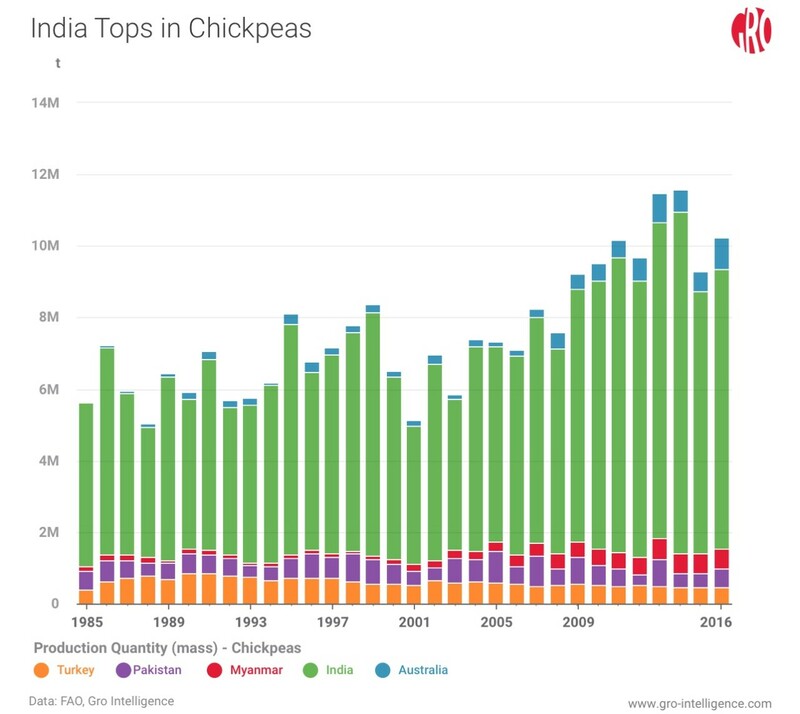 And while India remains the biggest producer of chickpeas, cultivation of this legume has expanded to include Australia, Myanmar, and North America. In the US, production of both chickpeas and lentils is forecast to expand by double-digit percentages this year. With Gro Intelligence, subscribers have ready access to a multitude of data on specialty crops such as pulses and can stay up-to-date with market developments. Chickpeas and lentils, cultivated for thousands of years, are considered staple crops in many regions. A good source of fiber and plant-based protein, these legumes have traditionally been an integral part of Indian, Middle Eastern, and Mediterranean cuisines. Chickpeas and lentils are grown in many regions of the world, especially western Asia and the Middle East, but have also taken root in Canada, Australia, and parts of the US. The charts above show harvested areas, in hectares, of both crops for the top two producing countries and the US. Total global chickpea production is just over 10 million tonnes, according to the the UN’s Food and Agriculture Organization. 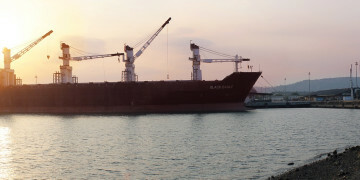 India accounts for about 70 percent of the total, or 7.8 million tonnes. Although the US isn’t among the top five producers, US output has been growing to meet consumer demand—reaching 371,000 tonnes in 2017 from 125,000 tonnes in 2013. This year, chickpea production in the US is projected to rise by 30 percent for the 2018 season, as planted acres jumped 33 percent in the current year, according to the USDA Economic Research Service. Many countries produce chickpeas, but India takes the top spot by a wide margin, producing 7.8 million tonnes in 2016, or 70 percent of total global output. The chart above shows global chickpea production by volume for the top five producing countries. 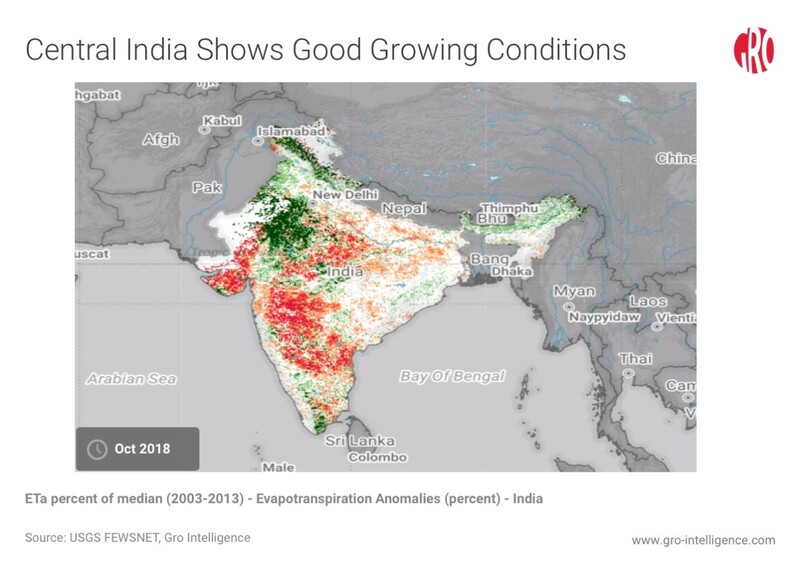 India’s central regions’ climate is well suited to growing chickpeas. Although chickpeas can tolerate precipitation, the crop does much better in dry conditions and well-drained soils, at between 15 and 25 degrees Celsius. Too much moisture can result in plant and root diseases, quickly decreasing yield and quality. India’s chickpea planting occurs in late October and early November, after the monsoon season of June to September. While chickpeas are grown in several Indian states, the biggest share, or 39 percent, comes from the central state of Madhya Pradesh, away from the major monsoon areas in the South. Chickpeas are currently being sown in the central Indian state of Madhya Pradesh, the country’s biggest producing region. Chickpeas thrive under dry conditions, which the state is currently experiencing. The display above shows evapotranspiration anomalies; areas in red indicate lower levels of moisture. Most lentils also come from one country, but in the Western Hemisphere. Canada produced 3.23 million tonnes of lentils in 2016 out of a total global output of just over 5 million tonnes, according to FAO. Farmers in the North American country began producing lentils about 40 years ago to provide soil cover over the winter rather than have a fallow field. But the benefits of lentils quickly helped the crop catch on. A leguminous species, lentils have the ability to fix nitrogen in their roots. This is beneficial in crop rotations, as the nitrogen can become available for subsequent crops like corn that have high nutrient requirements for growth. Today, more than 5,000 farmers in Canada grow the crop. US lentil production is also growing, and the US is the fourth-biggest producer in the world, after India and Turkey. Twenty years ago, the US produced just 87,900 tonnes of lentils—today that figure is 255,000 tonnes. The USDA forecasts US lentil production in 2018 will increase by 20 percent from the previous year. US acreage devoted to lentils is also forecast to expand, from 785,000 acres this year to 940,000 acres in the 2019 season. 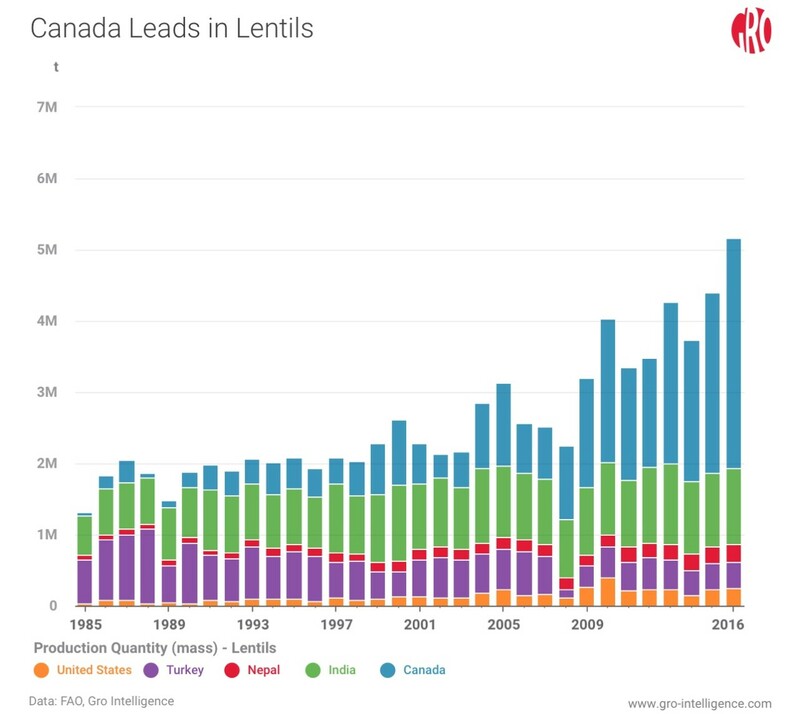 Canada boasts the title of top lentil producer globally, growing over 3 million tonnes in 2016. Production in other countries is growing in response to consumer demand. The chart above displays the top five lentil producing countries by volume. Recent studies focusing on the nutritional profiles of chickpeas and lentils have helped push the legumes onto more consumers’ plates. There is more iron in 100 grams of lentils than in the same quantity of beef or chicken, and a serving of lentils contains less than 1 percent fat. A recent study by the University of Guelph, published in the Journal of Nutrition, found that when healthy adults replaced half of their daily carbohydrate intake with lentils, instead of potatoes or rice, their blood-glucose levels fell by at least 20 percent. By practicing this over time, the researchers believe people can reduce their risk for diabetes. Numerous nutritional studies also underline the healthful properties of chickpeas, which are a good source of fiber and plant-based protein and contain a number of vitamins and minerals, including calcium, magnesium, and vitamin K, which all play important roles in bone strength and overall health. Fiber acts to decrease cholesterol in the bloodstream and aid in regulating digestion, among other benefits. The growing popularity of vegetable-based diets has helped boost consumption of pulses. Vegetarians and vegans together represent 6 percent of the US population, a figure that has nearly doubled over the past 10 years. According to consumer research conducted by Innova Market Insights, in 2017 there were 2,500 new food products that contained some sort of pulses. This represented an 11 percent increase from the previous year. Meanwhile, the number of food products containing kale and quinoa, which both rose to superfood status in earlier years, had fallen 15 percent and 7 percent, respectively, during the same period. 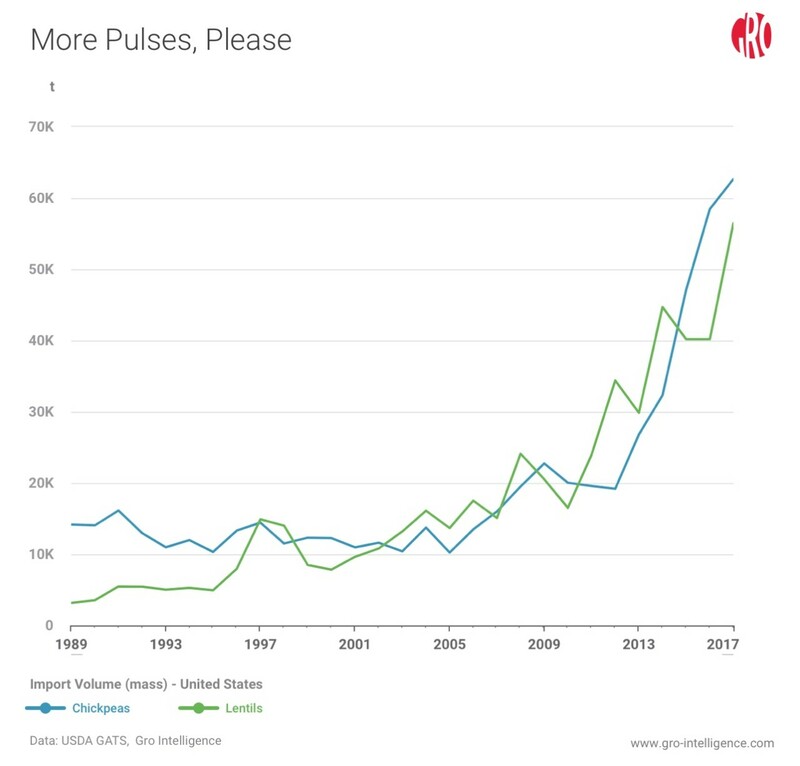 To feed growing appetites, US imports of pulses are rapidly rising. Throughout the 1980s and 1990s, the US imported less than 15,000 tonnes of chickpeas a year. 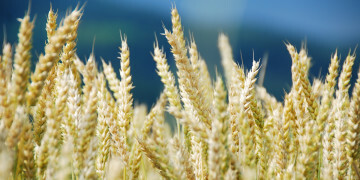 This grew to 19,191 tonnes in 2012, according to the FAO. And in 2017, US imports of chickpeas jumped to 62,676 tonnes, the USDA says. US chickpea and lentil imports have increased sharply over the past several years as more consumers add pulses to their diets. The chart above shows import volume of chickpeas (blue line) and lentils (green line) by the US over the last 30 years. 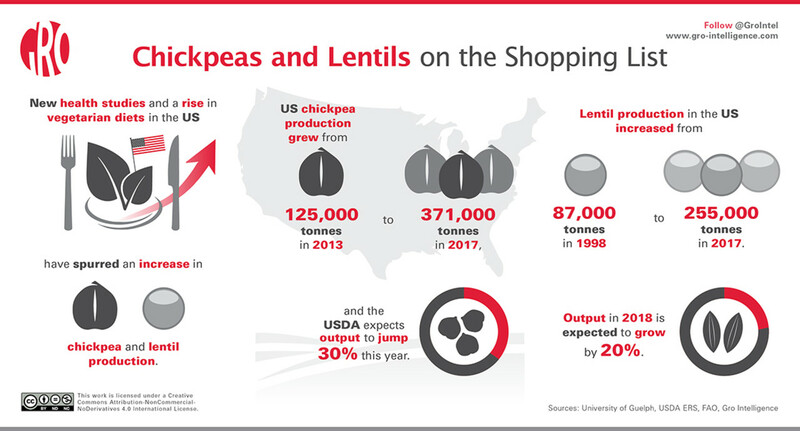 Lentil consumption in the US is growing rapidly as well. Imports of the pulse crop, which stood at 3,171 tonnes a year in the late 1980s, now tops 56,000 tonnes a year, according to the USDA. Chickpea and lentil consumption is expected to continue an upward climb in the US and other developed countries as people’s diets shift to more healthful ingredients. Plantings for both crops will follow suit, with US acreage committed to the two pulses forecast to expand by 20 to 30 percent for next year. Still, the US market will continue to depend on imports from other major producing countries. 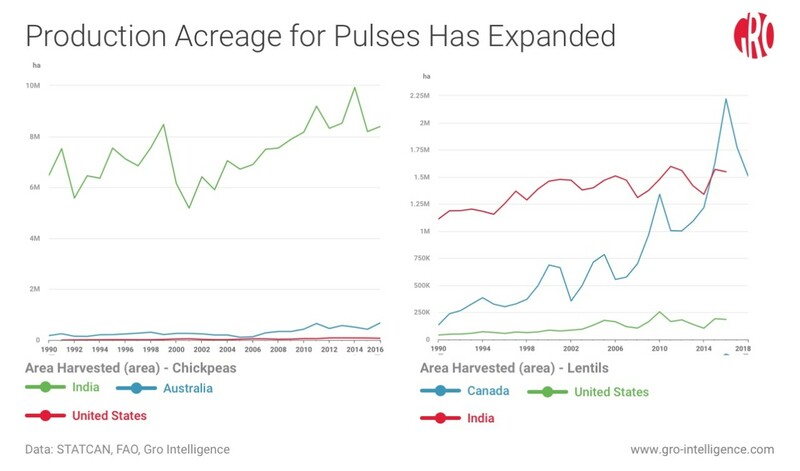 With cultivation of chickpeas and lentils spreading globally, a shortage of these pulse crops to satisfy consumer demand appears unlikely. 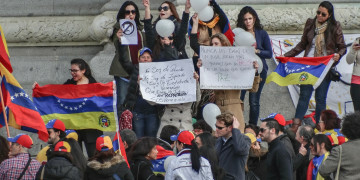 How Deep Is Venezuela's Food Crisis?